An alfredo you can feel better about! 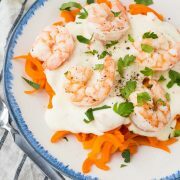 This healthy shrimp alfredo offers lots of lean protein, and is low carb and flavorful thanks to carrot noodles! Valentine’s Day is right around the corner, and I haven’t even begun to think about what we’re going to do. It’s on a Tuesday so I can’t imagine it’s going to be anything too outrageous. I imagine that we’ll enjoy a quiet evening at home (well, as quiet as it gets with two small children) and maybe we’ll squeeze in a date night on the weekend. I do think that a quick and easy meal is in order, as always. 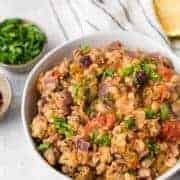 However, this one is perfect because it’s not an everyday type of recipe (I’m thinking tacos, spaghetti, etc), it’s a little fancier and more special. BUT still ready in 15 minutes. Seriously. FIFTEEN minutes! And it’s an alfredo recipe you can feel really good about. 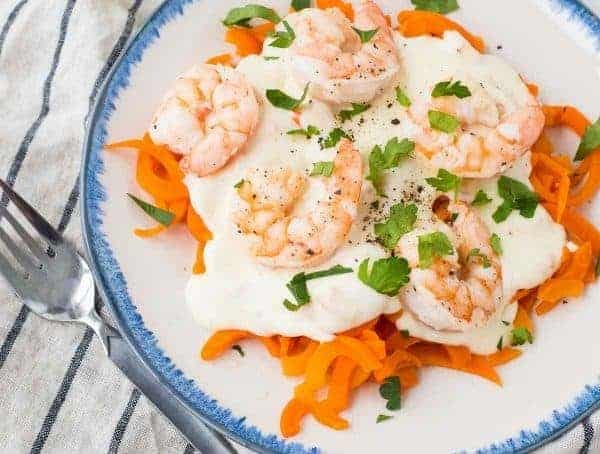 Sweet carrot noodles are the base of this instead of actual pasta, so if you’re following a low-carb diet, this healthy shrimp alfredo is a great recipe for you. 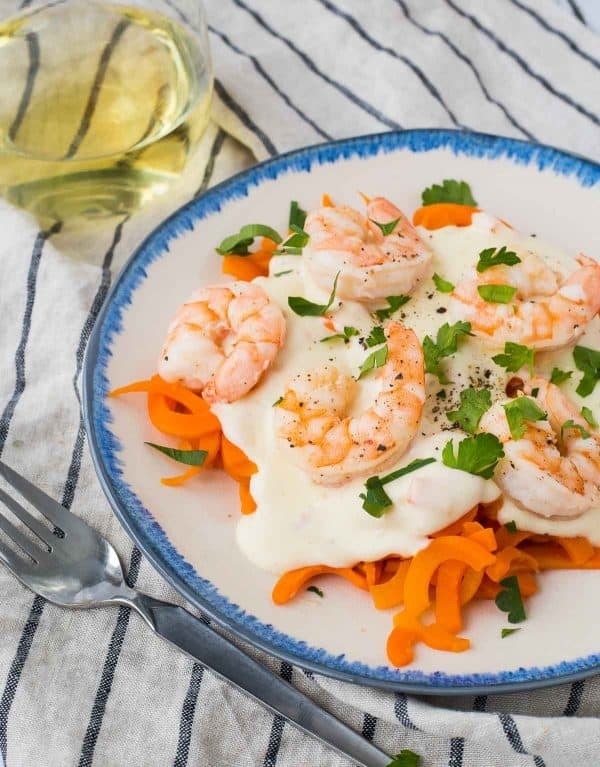 The shrimp are packed full of lean protein and the alfredo is lightened up a bit by using half and half instead of heavy cream. If you’re new to vegetable noodles like these carrot noodles, I highly recommend them! They’re so full of flavor and nutrition plus they’re lower in calories. I use The Inspiralizer to spiralize vegetables. I’ve used three different spiralizers and the Inspiralizer is my favorite by far – it has great features that others do not have. I use it to make zucchini noodles (aka zoodles), sweet potato noodles, and more! If you’re intrigued, make sure to also try my turkey bolognese with zucchini noodles – it’s a great introduction to vegetable noodles. If you’re hesitant to try this with carrot noodles, it would be great with a mix of fettuccine and carrot noodles, or of course you could use all traditional pasta. I encourage you to give it a try though! 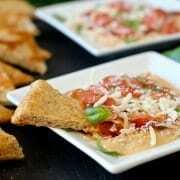 It would also be tasty with zucchini noodles! PS: Need some assistance in the shrimp department? This post on how to saute shrimp for pasta will be a huge help! Bring a large pot of water with 1/2 teaspoon salt to a boil over high heat. When water boils, add carrot noodles and cook until tender, 2-3 minutes. Drain when finished. Meanwhile, heat oil and butter over medium heat and saute shrimp, about 1 minute on each side or until pink and shaped more like an “O” than a “C.” When finished cooking, remove to a plate, reserving oil in pan. To oil, add garlic and cook for 1 minute or until soft and fragrant. Add flour and cook, stirring, for 1 minute. Slowly and gradually whisk in half and half, whisking constantly, until thickened (3-4 minutes). Reduce heat to low and add Parmesan cheese, whisk until melted. Taste and season with salt and pepper. Add carrot noodles and shrimp and toss to coat everything in alfredo sauce. Garnish with parsley if desired and serve immediately. Note: If the thought of a plate of carrot noodles terrifies you, try mixing whole wheat fettuccine with the carrot noodles. Cook the fettuccine according to the package and add in the carrot noodles in the last 2-3 minutes of cooking. Verdict: I won’t lie, shrimp in general is not my favorite. I really wish I liked it more! But I did love the carrot noodles with the alfredo sauce! So thick, creamy, and flavorful. 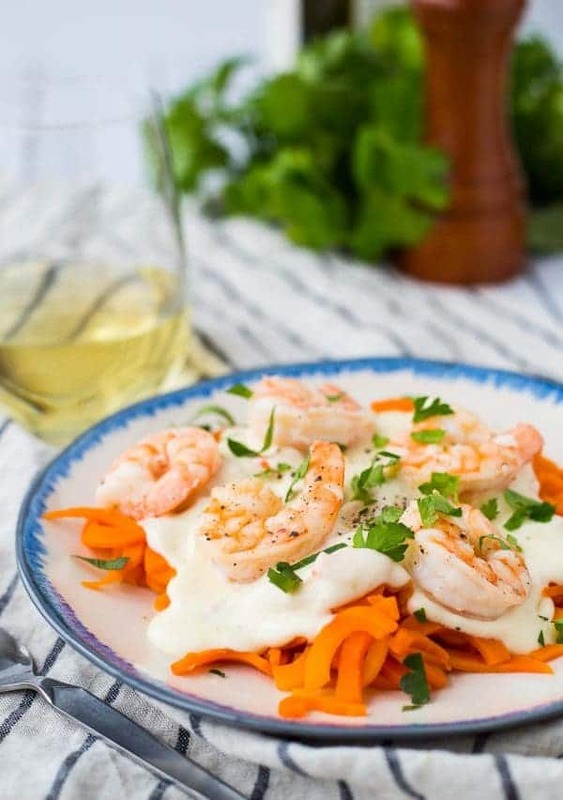 Husband’s take: He loves this healthy shrimp alfredo! He ate most of it since I’m not a huge fan of shrimp. Changes I would make: None are necessary but like I mentioned in the recipe notes, if the thought of a plate of carrot noodles weirds you out, try mixing them with some whole wheat pasta. You’ll love the combination of the two! Difficulty: Really easy, and ready in 15 minutes. So amazing! 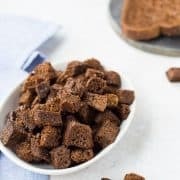 Disclosure: I have been compensated by Milk Means More for my time to develop this recipe and write this post. All opinions are as always, my own. Find out more about why Milk Means More on Twitter, Facebook, YouTube, Instagram and Pinterest. This was super easy & full of flavor. Low carb. I did add crumbled bacon because what doesn’t get better with bacon. On my list to make ASAP, thanks!